It is back to school time, and whether you child plays at a park or a school, you have probably been on a playground that uses recycled tires for cushioning. In the past, I have questioned the safety of children playing with old tires; however, I remember enjoy tire swings immensely as a child. Now, the Green Guide has reported on the safety of recycled tire cushioning found on many playgrounds. A few years ago, we installed new playground equipment at our school. As the teacher in charge of the project, I was encouraged by parents to explore the option of recycled tires for cushioning, which comes in either a mulch or mat. At first, I thought this was a good idea as it involved recycling and really does provide a great cushioning, but in the end we chose pea gravel for cost, environmental, and safety concerns. In the US, 290 million scrap tires are generated each year! Reusing them in playgrounds is a good idea from a recycling viewpoint, but what about our children’s safety? To create playground cushioning, the tires are ground up and magnets are used to remove metals; however, according to the California Office of Environmental Health Hazard Assessment (OEHHA), ground up tires release 49 different chemicals, including seven carcinogens. As the tire playground surfaces age and are exposed to light and heat, these chemicals, which include heavy metals, are released into little lungs. New tire surfaces outgas VOCs for up to two years. Of course, OEHHA says the impact on a child’s health is minimal and would result in nothing more than a stomachache. Other environmental groups disagree. 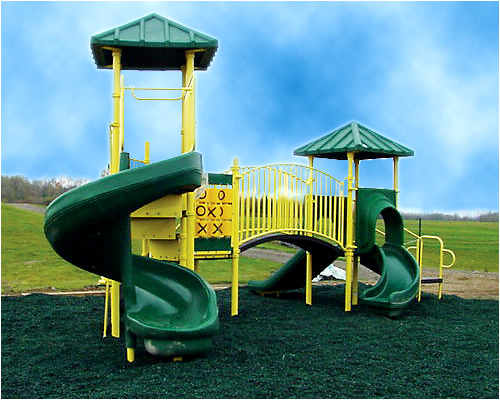 When you consider the potential risks to our children, as well ecological risks to fish and wildlife, recycled tires are not the best choice for playground cushioning. The Green Guide recommends wood chips; however, I feel that pea gravel is a more sustainable option that needs replenishing less often to meet the cushioning requirements. The next time my kids want to play on a recycled tire playground, I think we will walk on by to a playground made with safer materials. Wow…this one is an eye-opener. We used recycled tire mulch in my mom’s front yard because we thought it was a great way to recycle, and we were considering using it in our kids’ play area. Thanks for pointing out the risks and offering up a more environmentally sound alternative (pea mulch). So… is this stuff still good for things like “silent” driveways and water-permeable sidewalks? Applications where you don’t have short, active people abrading it and breathing the dust and fumes? We need _something_ we can use all those tires for – they are one of our most difficult to re-use/re-cycle “disposable” items. For 15 years, I’ve been using the mantra…what good is it to save the environment, when we are still poisoning the occupants. Recycling post-consumer waste is good for the outdoor environment, but can have significant downsides. Remember, in the world of green, eco-friendly materials, there is no perfect product. You must always decide which “degree of green” you are vying for, before making choices. What might be good for the environment may be dangerous for the human occupants. Good comments here. Nothing is 100% safe OR friendly. Pea Gravel might be better for the health of the kiddos, but the environmental havoc caused by obtaining the gravel (and processing it) isn’t pretty either. I live close to a big “gravel pit” town. It isn’t nice. Unfortunately, since most people want to be “green” and do more “natural” landscaping with stone and rock (instead of watering grass), the demand for pit mining of these materials is on the rise. What’s good for one person, may turn out to be bad for another. I’ll stick with the wood chips from cast-offs of the mills, I may need to replace it in a few years, but those are the breaks. That’s a good point chchiovitti. We successfully stopped a gravel plant from moving into our community. We were concerned about airborne asbestos, which occurs naturally here. My son always coughs at playgrounds with tire mulch. Does anyone have info about allergic reactions to the rubber?